Continued education trainings that are not approved by OESAC may not be accepted for CEUs by Oregon licensing agencies. To further technology education in the State of Oregon, particularly in known environmental arenas such a water supply operators, wastewater operators, hazardous wastes technicians and other environmental media technicians as needs arise. To accomplish this mission through cooperative efforts among community colleges, professional organizations, adjacent States, public entities and private training units. 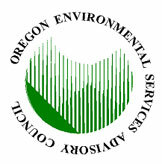 The next meeting of the Oregon Environmental Services Advisory Council (OESAC) is scheduled for Thursday May 9, 2019, at 10:30 am. The meeting will be held at the Salem Willow Lake Wastewater Treatment Plant in the Willamette River conference room. The Board meeting will immediately follow the CEU Committee meeting. Below are the State of Oregon programs that issue licenses/certifications. Please do not contact them with CEU and OESAC questions. Contact information for CEU and OESAC questions is at the top of the page under the words, "OESAC CEU Committee". Oregon Health Authority, Drinking Water Services. The State of Oregon Department of Environmental Quality (DEQ) certifies these personnel. The DEQ Onsite Wastewater Management Program.